The Federal Practice Group will be closed in honor of Independence Day on July 4, 2018*. 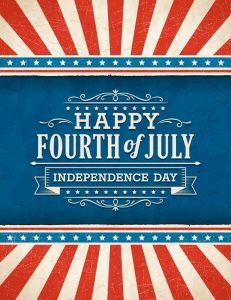 We wish all of our friends, family and clients a festive and safe 4th. Business hours will resume to normal on July 5, 2018 at 9:00 AM. *Should you need immediate assistance during this time, please send an email to:emergency@fedpractice.com with your attorney’s name in the subject line. In the body of the email, please send a brief explanation of what you need assistance with and the best contact number to reach you. Upon receipt of your email, someone from our office will reach out to you within 24 hours.